James Toseland, Britain's leading motorbike racer and double World Superbike Champion, has been captured in an oil painting by award-winning artist, Glenn Badham. Commissioned by Odeon International Licensing and signed by James Toseland, just 395 numbered prints will go on sale on 24 July to coincide with the British round of MotoGP – in which James will be competing. Isle of Man-based James Toseland began racing motorbikes as a teenager and has a huge British fan base. He gained global popularity when he won the World Superbike Championship in 2004 and again in 2007 before moving to the MotoGP series – the Formula One of bike racing – last year. Rarely do the worlds of motorcycle racing and fine art combine and it is a testament to the skill of Glenn Badham that he has produced a composition of such vibrancy and unparalleled artistic merit. Glenn, whose paintings are in private collections around the world, has also been displayed in the Royal Gallery of the House of Lords. Glenn is no stranger to the passion, frustration and single-mindedness of sportspeople striving to be the greatest, and his recent projects have included painting the Northants Saints rugby squad. The limited edition prints measure 55cm x 43cm (22 inches by 17 inches) and will go on sale at selected UK art galleries from 24 July, with prices expected to be in the region of £200. Prints can, however, be reserved in advance of the on sale date at an introductory price of £175. 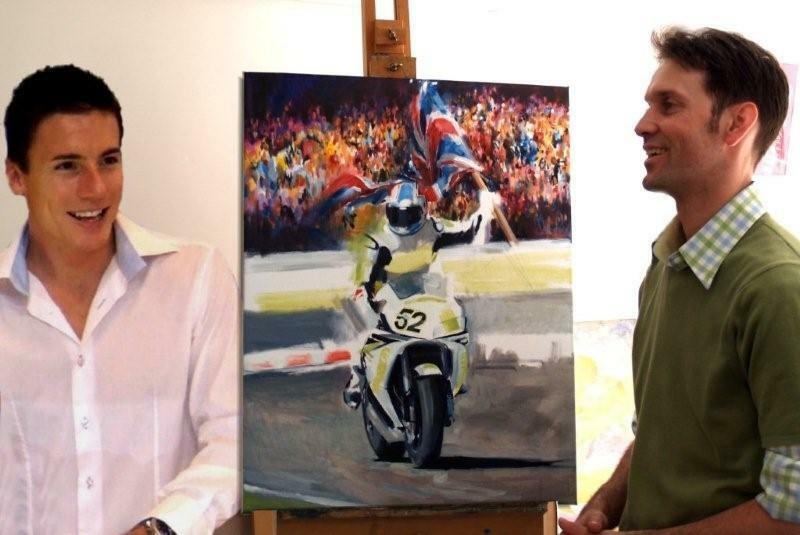 Toseland said: "I feel honoured to have been painted by Glenn. He has captured the excitement and drama of bike racing in a way I didn't think possible."